Zendesk Support is a trademark of Zendesk, Inc.
Add a Zendesk Support form to your WordPress site. This plugin will embed the form directly into your page content, matching your theme’s styling where possible. You can add a basic form very easily in minutes! Want to create multiple forms with different fields? You can setup custom fields and options using the advanced features available. Uses the Zendesk API to open a ticket directly within your account. No need to worry about missed emails! Add file attachments to tickets. Support for Zendesk custom ticket fields. Create multiple forms with different ticket fields. Set the Priority level of tickets submitted by each form. Pre-fill form fields with user data when logged in to WordPress. Redirect user after form submission. Spam protection to avoid fake submissions. Double click protection – Stop people from submitting the form twice by accident. Google Analytics Events tracking on form submission. Automatically check email address for typos and suggest solutions via mailcheck.js. Add User Agent and CloudFlare Geolocation data (if available) to the ticket. HTTPS or plain HTTP support (HTTPS recommended). HTML5 Pattern (Regular Expression) validation on fields. Data is validated/sanitized before sending to Zendesk. We created this plugin for our own support system. So you can be sure that we will update and maintain it into the future. If you have any feature suggestions, you are welcome to ask in the support forum. If you would like to translate the form into your language, please click here. Go to ‘Plugins > Add New’ in your WordPress dashboard and search for “Zendesk Request Form”. Install and activate the plugin. 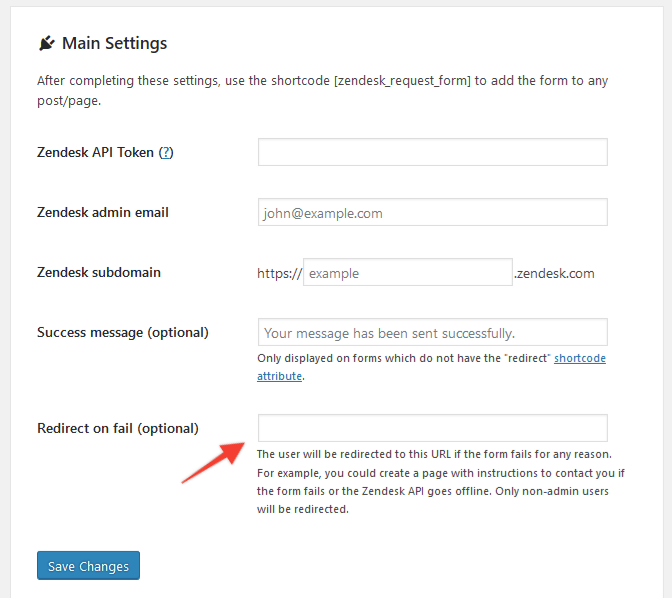 Add your Zendesk API information to the options under ‘Settings > Zendesk Form’ in your WP dashboard. You can generate an API key from your Zendesk dashboard using this guide. Go to ‘Settings > Zendesk Form’ and configure your forms. This is just brilliant. Saved me so much coding time. Allows you to hook in multiple custom forms via the Zendesk API, without needing any additional paid Zendesk Ticket Form add-on and without needing to code the API integration! Absolute huge thanks to the dev for providing this - really saved my day as Zendesk enquiry forms are more complex to set up than first anticipated. Embedding the Zendesk widget on every single page of a site adds weight in loading the site -- it was one of the slower items on my site. This solves the problem with a simple, clean, easily styled web form on a single page. You can also easily redirect to another custom Page when the support request is accepted -- or redirect to a custom error page if it fails. Love, love, love this! Thank you so much for sharing it. The plugin is straightforward and easy to setup. This quickly solved our Zendesk email deliverability issue when submitting from a standard contact form. Great plugin with sensational support! The plugin is incredibly easy to configure and use. Only stumbled across some minor problems setting it up, which was resolved by sensational support from Phil. He is truly a real-life superhero! Highly recommended plugin. Perfect solution and great developer! This plugin has helped us out massively. We were looking how we could use the Zendesk API ourselves to create multiple ticket forms but were really struggling. This plugin has saved us days of dev work and potentially cost with Zendesk if we had to purchase their ticket forms feature. The developer is great, responds to support requests really quickly and pushes out updates on the fly when he can to service a user's request. Amazing! Great plugin! And thanks for the upload attachment option! “Request Form for Zendesk” is open source software. The following people have contributed to this plugin. “Request Form for Zendesk” has been translated into 10 locales. Thank you to the translators for their contributions. Translate “Request Form for Zendesk” into your language. Catalan, Dutch, English (Canada), English (South Africa), English (UK), English (US), German, Greek, Italian, Russian, and Swedish.